Jay Holgate didn't want to change the world. He just wanted to change the way his business did business. So he turned it green. And by doing what was right for him, he may just change the world. The legacy of Hurricane Katrina is mostly broken lives. In that debris, one man saw something that fundamentally changed him. "People were leaving their homes,” recalled Jay Holgate. "With just the shirt on their back, and they were welcomed in Atlanta by gas prices that were $3.50 a gallon -- and we just thought that that was criminal." In the courier business since the mid-90s, Jay Holgate was rocked by the fallout from Hurricane Katrina. He began converting his courier fleet to hybrid cars. Half of the Green Express courier service fleet is green, with more on the way. Before they added green cars to their fleet -- the hybrid vehicles -- the courier company was getting about 21miles to the gallon. Now they're getting between 46 and 51. They've cut their fuel bill in half. They've cut their toxic emissions by 80 percent. They've reduced the amount of carbon pollution by 30 tons. Since January they've gained more than 100 customers. By switching half his fleet to hybrid vehicles, Jay Holgate is saving $2,500 in fuel costs a year. "The main part was the hybrid cars,” said Julie Hay of Midtown Bank. 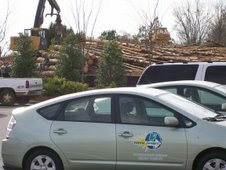 "Them being environmentally friendly, their service is excellent. It really is." The Midtown Bank in Atlanta switched to Green Express as part of its decision to be more environmentally friendly. "We don't sit in traffic,” said Brent Hilburn of Green Express. “We don't waste fuel and we don't waste time." We don't need to look far to see the mark of man's hand on this planet. Jay Holgate is doing what he can to lighten the touch. ATLANTA, GA – Earth Share of Georgia joins forces with Green Express, the first courier in the country to switch to hybrid cars. For every new account that mentions Earth Share of Georgia, Green Express will donate one dollar to Earth Share on each delivery. According to Madeline Reamy, Executive Director of Earth Share, “Our partnership with Green Express is a perfect fit. We work closely with Atlanta businesses who look to us for new ways to ‘green’ their workplaces. Here’s an easy way to reduce air pollution and save fuel.” Earth Share of Georgia is the state’s only dedicated environmental fund, and raises money for 61 leading environmental groups through employee giving campaigns and Earth Day events. Jay Holgate, managing partner of Green Express courier knew it was time for a change when gas hit $3 a gallon last year. “Affordable gas is the lifeblood of any courier company,” Holgate explains. “With gas prices at an all-time high, our hybrids are delivering significant savings.” He sensed that Atlanta companies would share his commitment to reducing their own use of imported oil, as well as their desire for cleaner air. The response has been tremendous. After all, every time a courier is used, that’s one less car on Atlanta’s roads. And now through Green Express, people will support Earth Share of Georgia. Green Express estimates the hybrid cars use 46% less gas than traditional cars. Their drivers travel at least 2,500 miles every day delivering packages throughout metro Atlanta in 16 counties. Green Express hybrids average 47 miles per gallon, while their traditional cars get just 25 miles per gallon. Plus, the hybrids are zero-emission vehicles while idling or going below 30 miles an hour. At higher speeds, they put out one ton of greenhouse gases to every 3.4 tons spewing from conventional cars. Once Green Express took the leap of faith going green, it became a crusade – a kind of challenging game – to filter every process through an environmental microscope. To boost efficiencies even further, the most advanced GPS mapping technology is used to reroute drivers to alternate roads to avoid the worst traffic – another way to save fuel. One wrong turn can waste a gallon of gas every day times 10 cars; that’s at least 2,200 gallons a year. Holgate encourages his customers to rethink how often they use their own cars for trips Green Express can easily handle. “We are already on the road using the most efficient routes driving zero-emission cars,” Holgate remarks. “It makes sense to let us run personal errands as well as business deliveries to save gas and people’s precious time.” Learn more at www.greendelivers.com. Earth Share of Georgia offers citizens one smart and simple way to care for our air, land and water. As Georgia’s only dedicated environmental fund, Earth Share partners with businesses and employees to support 61 leading environmental groups through workplace giving campaigns, Earth Day and other activities. For more information on how you and your company can help carry on the Earth Day message throughout the year, call Earth Share of Georgia at 404-873-3173, or visit www.earthsharega.org.